The Visual Basic Editor contains several different windows that you use when developing macros. Although Microsoft provides a basic window setup, like most development environments, you can customize this setup by rearranging, resizing, removing, and adding windows. The most commonly used windows are the Project Explorer, the Properties window, and the Code window. You may also find the Immediate window useful for quickly testing a statement before adding it to your code. You can only access some windows, such as the Toolbar and UserForm windows, from specific locations, such as when you create a userform. You can select which windows display and the locations where they display. The View menu lists the available Visual Basic Editor windows. For example, you can only view the Toolbox from a UserForm window. When you select a window from the menu, it displays in the location where you last placed it. In other words, if you placed the Project Explorer window in the upper-left corner during your last session, that window reopens in that same location. You can move windows using the standard drag-and-drop features inherent to Microsoft Windows. You can also resize the windows via the edges of the window. You can also attach windows to specific locations of the Visual Basic Editor by using the docking feature. When you dock a window, it becomes part of another window attached at the specified location. Keep in mind that docking a window does not mean that the window always displays in the Visual Basic Editor. If you set a window to dock, Excel docks in the location you specified each time it displays. You can only dock the windows on the top, bottom, left edge or right edge of the Visual Basic Editor. 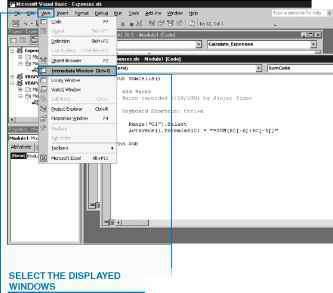 Click the menu option for the window to display within the Visual Basic Editor. ■ The selected window displays in the last viewed location. ■ The View menu lists the available windows for the selected window. ■ You can click and drag the window to a new location. ■ You can close a window by clicking the Close button ( 0 ). How to arrange your windows in excel vba dock? How to rearrange vba project window?